Parent participation is a huge part of what makes Open Gate tick. Through it, we grow as parents, develop community, support one another, and build a school that nurtures us all. You participate in your child’s classroom one day each week. You rotate through different areas such as the game room, the art room, the kitchen, etc. In the classroom, we observe our own children and their peers, develop skills and strategies we can take home with us, and have a terrific time making fun messes and exploring our world. Parents attend two evening parenting classes each month, generally at Open Gate from 7-9: 30 on Tuesday evenings. Your child’s teacher leads your parent education, and together with your classmates you’ll learn about child development, parenting strategies, and educational approaches, looking to the children in the class to provide real-world examples and help you learn. Plus, you’ll laugh a lot, get support for the challenges of parenting young children, and make friends for life! Participate in our annual All School Cleaning. Contribute an hour of service at both the Holiday Auction and the Touch a Truck Event. We ask each family to contribute at least $250 each year to Open Gate through fundraising. But don’t worry, you won’t be selling wrapping paper to your friends! 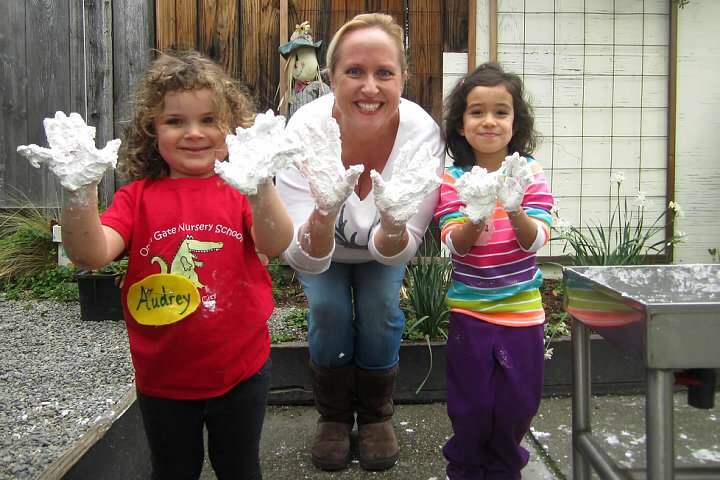 We have a variety of fun activities that build community while we fundraise.